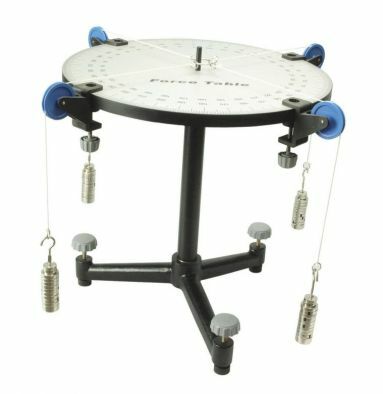 With a large, 40cm diameter tabletop, 3cm thick support column and heavy cast base with levelling screws, this force table is suitable for use in any basic physics lab. The durable polymer tabletop carries an angle scale with 0.5° divisions, marked every 10° in both rotation directions. Four tableclamp pulleys are included, each has a circular cut-out with a fiducial mark for accurate angle measurements. Four sets of slotted masses, each 150g x 5g including hangers, are supplied with the table. The slotted masses have a keyhole pattern which secures them during adjustments. The cords include split rings for easy connection, allowing three-force and four-force equilibrium arrangements to be rapidly constructed. Includes spirit level. The table is 41cm high.